Develop Ball Control by Playing with Different Surfaces. There seems to be an obvious way to develop great players that we're almost all missing. Because of the height of the table - 30 inches - kids can't really play until they are about five or six years old, and even then it's rather awkward. (It's especially hard hitting backhands at that age, until their elbow is over the table.) However, there are many stories about how top players started playing much younger, as young as two or three, on shortened tables. They then move to regular tables around six or seven. How to Quadruple Your Chances of Winning Those Five-Game Matches. I've recently gotten into some discussions about Ma Long's serve. He's the reigning World and Olympic Champion, and while his world ranking has dropped to #7 due to lack of competition (plus his recent loss at the Bulgarian Open to Liam Pitchford), he's still generally considered the best player in the world. But the simple reality is that he, like many other world-class players, rarely serves legally. Most of his serves are forehand serves where he throws the ball high and towards him, and as it comes down, he thrusts his head forward and down. The ball illegally goes behind his head, and he contacts it behind his chin, so the opponent can't see contact. Then his racket follows the ball, making it appear that he contacts the ball below the head. That's one of the main advantages of this technique. I'm postponing the blog one day so I can include coverage of the USATT Teleconference scheduled for Monday night at 7PM. See you tomorrow! 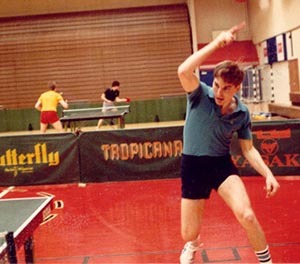 Top table tennis players can often seem a different species than the rest of us. After all, they have powers and abilities far beyond those of mortal men! Here are ten things about top players that might surprise you. Away from the table they aren't that much different from other people. Really! It's only when they are training, and how intense they often are during training, that sets them apart. Bother them while they are training and you might get a slightly irritated "What do you want?" look. So wait until they are off the table and you'll find them 100% normal. Or at least close! They get their touch on short balls not by just hitting the ball lightly, but by grazing the ball. The grazing motion not only puts backspin on the ball, but makes the ball bounce off the racket more slowly, making it easy to drop the ball short. As you probably noticed, the site has been down since Friday morning, July 13. It literally went down minutes before I posted my Friday blog, which I wasn't able to post. My technical person wasn't able to resolve the issue until last night. What had happened was the "Access Log" went over 1 GB, causing an "overload of MySQL resources." Unfortunately, due to some unforeseen side problem, the site almost immediately went down again. Hopefully it'll be up soon. Below is the Monday blog, where I took the Friday blog and added lots of new stuff. I was planning on blogs on Fri, Mon, Tue, and Wed (mostly covering the Nationals), but couldn't do them since the site was down.